Prepared ALHWaysTM is healthy living – physically, relationally, and spiritually in local and sustainable communities and economies as our Creator designed and provides. It’s “the cure for the healthcare crisis” – and a whole lot more. Prepared ALHWaysTM gives insight into productive local economies – preserving and growing tangible assets to support abundant living in sustainable communities. Helping you to keep your financial house in order – no matter what. 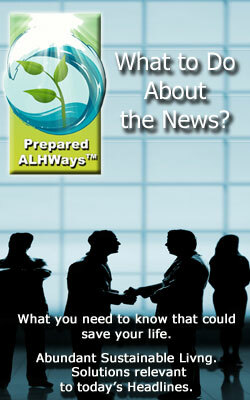 Prepared ALHWaysTM is about essential life giving provisions – water, food, health care services, and infrastructure. Joyfully, together, we build a simpler, yet better, life – for God’s glory and for the good of His children and Kingdom.